Sinn has a rich history of producing hunters watches, and over the years these watches have become quite collectible. In most cases these watches have been available only in the German market and featured a variety of complications. 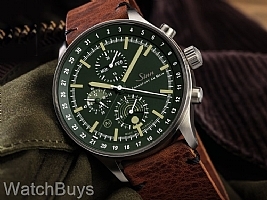 The new Sinn 3006 Hunter Chronograph breaks with tradition and is available outside of Germany. Further it is the most complicated of any of the previous watches in the Hunter’ Series. The dial is matte dark green, with ivory hour markers. This watch also offers excellent visibility at night through the use of luminous hands and indices. 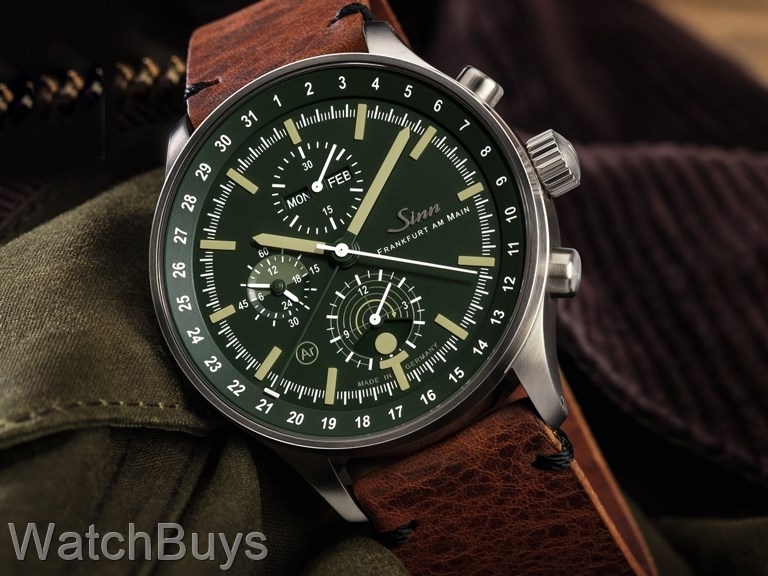 The Sinn 3006 Hunter Chronograph features a 24 hour indicator in the register at nine. This indicator provides a quick indication of the time in AM / PM format with further visual indications through the use of different shades of green. Additional functions include a date display shown by a centrally mounted hand pointing to the date on the outside ring of the dial. The day of the week and month are indicated in rectangular windows just below 12. All of these functions may be quickset through the use of the crown and a special pusher at 10. The moon phase display at six is more than just decorative. The German federal hunting law (Bundesjagdgesetz) prohibits hunting with the aid of artificial light sources (section 5, § 19, paragraph 5 a). In order to legally hunt authorized types of game at night in Germany, there must be adequate natural lighting from the moon, and the design of this moon phase indicator meets these requirements in a highly legible way. The moon phase display on the new Sinn 3006 is designed to show when the moonlight is bright enough to see and catch game. Sinn's Tegimenting technology uses a special process to change the molecular structure of the steel. The result is a hardness factor of up to 1,800 Vickers, which is nine times harder than the stainless steel used in most watches today. This extreme hardness provides for outstanding resistance to both scratching and other blemishes over the life of the watch. Finally mechanical watches require oils to ensure proper operation, and the proper care of any mechanical watch movement mandates that these oils maintain both their viscosity and lubrication properties. Sinn has found that filling the case with inert gas can help prevent the introduction of humidity into the case, as well as provide a more stable environment for the oils that lubricate the movement. This inert gas prevents air molecules from entering the watch case, which not only promotes a dry and stable environment, but also prevents the dial and crystal from fogging during temperature changes. The second aspect of this technology is a dehumidifying copper sulfate capsule that absorbs unavoidable diffused atmospheric moisture within the watch, thus slowing down the aging process of the oils. The screw-down crown and chronograph pushers are protected by Sinn’s D3 System, which removes the traditional tube inserts found in most watches and provides a more solid protection against outside elements. The case finish on this watch is satinized and the water resistance is 200 meters. This watch is fitted with a Sinn brown calf leather strap with black stitching and signed Sinn tang buckle. When fully wound the power reserve is 44 hours.